Timed to the 111th anniversary of the opening of the New York City subway on October 27, 1904, a group of historians and designers gather for a public symposium focusing on the past and future evolution of one of New York City's most key graphic works: the subway map. Admission is free, but reservations are requested. During its first half-century, maps of the subway were based on the three original operating companies (IRT, BMT, IMD). Although the subway was unified in 1940, it was not until 1964 that a new basic design was put forward by R. Raleigh D'Adamo that dispensed with the historical operating companies and introduced the modern nomenclature and color-coding of subway routes. Fifty years ago, in the fall of 1965, the Transit Authority adopted D'Adamo's design concept. The highlight of the history section of this evening will be the launch of the first digital reconstruction of Raleigh D'Adamo's highly influential hand-drawn map of 1964, which had been lost until last year. Since the MTA began publishing its open data in 2008, over two hundred mobile apps using MTA data have been launched by the developer community. Most of those for navigating the subway use licensed copies of the standard MTA pseudo-geographic map, or a conventional topographic map such as Google. 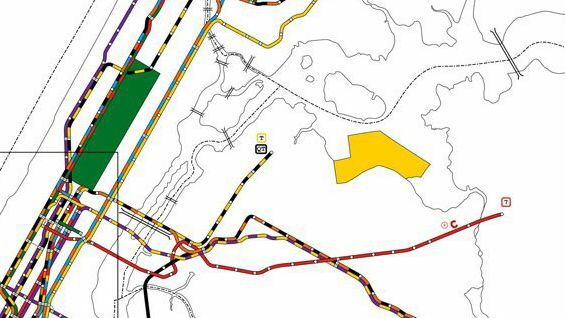 Notable exceptions are Kickmap and the MTA's own Weekender, which innovate the design of the map. In moving from paper maps to electronic maps, the design horizon expands enormously. An electronic map can have multiple layers of information that can be sensitive to day-v-night and weekend-v-weekday, to closures and re-routings (planned and unplanned), to station facilities (eg step-free access and wifi), and to user preferences. Is it time for an emerging 'best practise' to become codified in information design standards? Is it time to think of an international graphical language of transit map apps, so that you can go to any city in the world and immediately understand the transit map? And the map itself is no longer an island but is embedded in an information space: mobile devices underground can pull in data from wifi and can push out data to make possible crowdsourced information services. How do we navigate these future possibilities? R. Raleigh D'Adamo, whose innovative map for the Transit Authority (TA) led the TA to jettison their long-standing three-colour mapping scheme, and to adopt a scheme in which each route is colour-coded. The same concept is still used today. John Tauranac, who led the 1970s committee that created the quasi-geographic subway map that has lasted (with some changes, additions and deletions) for 35 years. Peter B Lloyd, historian of the subway map and author of Vignelli: Transit Maps (RIT Press, 2012). Eddie Jabbour, principal of Kick Design, a branding agency. With his son Dan, he designed the KickMap transit app, which has had more than a million downloads and has been featured in several books on information design and mapping. Joe Brennan, renowned for his scholarship on the subway, who has for twenty years been maintaining a subway map that has garnered much praise. Sarah M. Kaufman, Assistant Director for the Technology Programming at the NYU Rudin Center for Transportation. She formerly worked at the MTA, where she led the Open Data program and created a conference and online exchange between the MTA and software developers. That program provides the foundation for the many subway map apps for mobile devices that are now on the market. Introduction by Peter B. Lloyd: Why is the transit map an 'ínformation design' problem? Presentation by R. Raleigh D'Adamo on how he created his 1964 map. Presentation by Peter B Lloyd on how the map evolved after 1964. Presentation by Eddie Jabbour on present and future transit mapping for mobile devices. Panel discussion on how the subway map should evolve in the future. The event is free but please RSVP. Attendees who RSVP will be rewarded with a postcard print of part of Raleigh D'Adamo's subway map (the downtown segment). This is a Limited print run of 855, available only to attendees who RSVP on Eventbrite.